The so-called “million-dollar” condos at Saratoga Avenue and Abbott Street have flooded for the second time in less than 4 months. 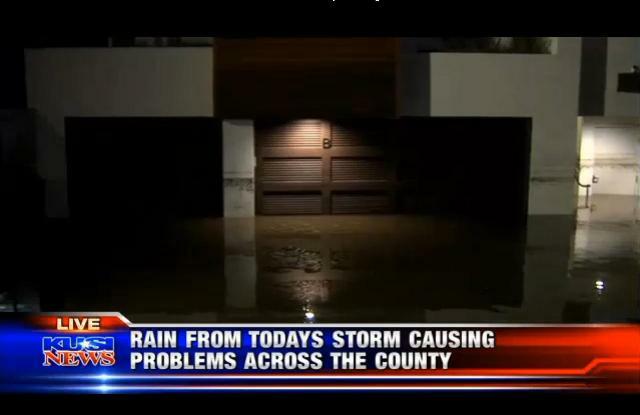 In this most recent series of El Nino storms, OB and other parts of the City and County flooded. As did the garage and some of the units at the Saratoga condos. And – as KUSI reported – there was a Lamborghini parked in one of the garages. The owner of another car that was under 6 feet of water at the same complex – visiting from Iowa on vacation – had leased a split-level, 3 bedroom unit for $5,000 a month and had parked his vehicle in the garage that accompanied the unit. And no one warned him of possible flooding. 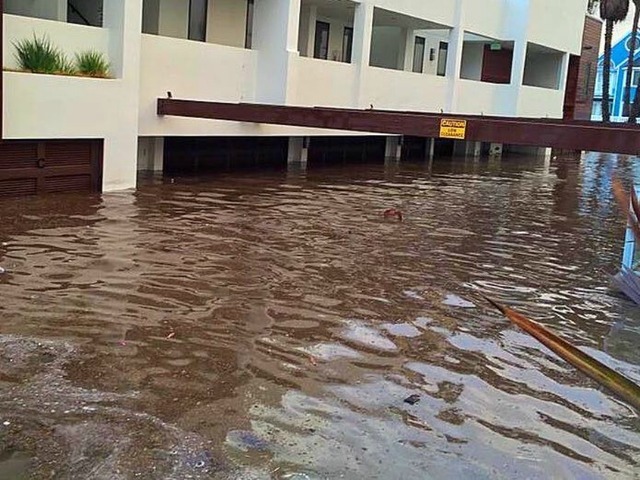 The very same condo complex experienced flooding during the rains in mid-September 2015. The big news then and reported worldwide was that a brand new Lamborghini was destroyed in the garage of the complex. The recent rains flooded the underground garage of the new condo complex at Abbott and Saratoga. 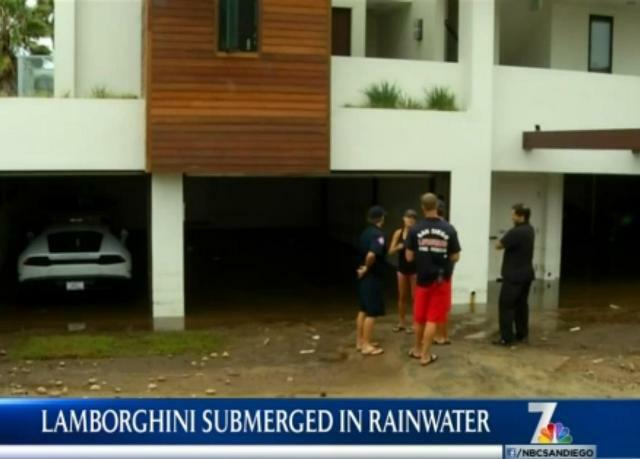 Most of the world knows about it because a brand new Lamborghini was submerged in the rainwater – along with 7 other cars in the same garage. Estimated repair costs are around $600,000. The flooding occurred at the so-called “million-dollar” condos – a brand new development with a very controversial history. Screen capture from 7nbc of condo complex underground garage. It has always flooded in that area. Either from hide tides, big rains – or both – this area has always been subject to overflow water. And more rains are on the way. I was curious if they flooded again, they’ll get round 3 tonight! Looks like our auto insurance policies just climbed again to buy this guy another Lambourgini. A little birdie told me that the OB Planning Board had something to do with approving these plans, which were changed from a previous plan. Sounds like the Rag might want to do some investigating. There are several articles on this blog about this whole project. Both versions were approved in split votes, with many concerns. One of the major ones was the fact that they lie in a de facto floodplain where stormwater collects during big storms (as opposed to the official floodplains in North OB where underground parking is not permitted). This flooding issue was brought to their attention by members of the public and by OBPB members like myself on multiple occasions. I even handed the developer’s representative printed photos of the most recent floods on that property in 2007-08 at one of the meetings. But to be clear, it was 100% allowable for them to have underground parking there with no variances if they so chose, as it was not an official floodplain. In contrast to some of the other issues related to the project, it wasn’t really an issue of OBPB discretion. But just because you can build it that way, doesn’t mean you should. Another point I raised on this at the time, for both the developer and the City to think about, was their legal liability in approving underground parking in a spot that is known to flood. Guess we’ll see on that, but I’m guess that there’s probably an insurance company out there somewhere that is sick of buying new Lamborghinis. To not consider that spot an official floodplain is absolutely absurd. It’s at sea level right in front of the ocean! I would imagine that the owners of the building must have flood insurance. But my bf points out that is not likely if it’s not considered a floodplain. Wow it’s all clear as mud. Thank you Seth for your concise comments on this matter. As I personally remember from the time this project was before the OBPB, the developer was told on multiple occasions and by multiple Board Members, that the proposed project would flood. As you so aptly stated “just because you CAN build it, doesn’t mean you SHOULD build it”. Sob! A flooded lamborghini, sob sob. Anyone who bought one of those condos should have checked with the locals first – but am not sure that the people there do much hobnobbing in O B, Could be wrong. You are wrong Tessa. Seems the people who owned that Lambo, and had to get a new one, are very nice people. They are on the Ocean Beach Facebook group. They seemed to have worked very hard for their money, so no reason to put them down just because they have dough. Many on the groups have done this and it’s just not fair. Strongly Disagree. Of course it’s fair. Those condos should of never been allowed to be built in OB, especially where they are located. I don’t care how hard you worked for your dough. Those condos don’t belong there and people in OB will always hate on whoever is living there. That’s just how it’s gonna be unless everyone in OB starts living in million dollar condos with Lambos in their garages. Steve, why hate those who work hard and want to live in those condos and drive Lambos? I dont begrudge your or any one else’s lifestyle as long as you dont cause me harm. Cant see the harm in wanting to enjoy the fruits of your labor. Making a guess….resale of this units is probably not going to be too profitable? Whoa, this is all too amazing, I don’t recall anything like this back when I lived there up to ’76 (though I don’t remember everything anyway!) Ah, but those were Good Times! Right Frank? I wonder how all this rain is affecting Sunset cliffs, which almost became Sunset Slopes. Is is still there or was it removed for a condo? If still there, was it and its pool flooded? What a great place to live, just half a block from Abbot and the Beach! As far as the siting of this condo, as a member of the first OPPB, I hope they aren’t responsible for this. I was the on-site manager from 95 to 98. When the city built the berm after putting in the grass it would flood every hard rain. Many a good memory from Saratoga Shores. Some tell Shelly from Cheswiks Brian seys22 HI. El Nino regects the rich invading O.B.! GOOD! The building is an abomination. Auto SEO, Such Example | Flood Insurance 2 Unit Duplex - INSURANCE.